Upon arrival in Vancouver, pick up your rental vehicle check in to your selected hotel. Included is admission to the Lookout Tower. Overnight in Vancouver. Day 2, Lac Le Jeune. You will have a short but scenic drive from the Pacific Coast to the interior of British Columbia. On the way, you will travel through the Fraser Delta and into the arid, semi-desert region of Kamloops. Dinner is included at your accommodation tonight. Overnight in Lac Le Jeune. After breakfast (included), continue eastward and you will pass into the Rocky Mountains today. The highway takes you over Rogers Pass, through Glacier and Yoho National Parks, past the Spiral Tunnels, into Banff National Park and by Lake Louise (a short detour from the highway) before you arrive into the town of Banff. Overnight in Banff. Your day is at leisure to explore the town and area. Included are admissions to the Banff Gondola on Sulphur Mountain, Cave & Basin National Historic Site and the Upper Hot Springs. Overnight in Banff. Your journey will take you back past Lake Louise today (in case you missed it the first time), and then northbound on the Icefields Parkway to Jasper. Along the way, you will see many glaciers, glacier-fed lakes and spectacular peaks. A stop at the Athabasca Glacier gives you the opportunity to take a ride on one of Brewster’s unique Ice Explorers up onto the glacier (admission included). Overnight in Jasper. 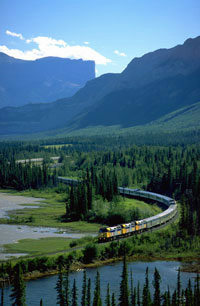 Today is free for you to explore Jasper National Park. You may wish to try a raft float trip on the Athabasca River, cruise on Maligne Lake, ride up Whistler’s Mountain on the Jasper Tramway, golf at the Jasper Park Lodge or take a hike. (Suggested activities not included). Overnight in Jasper. After a free morning, drop off your rental car at the train station in the early afternoon, then board VIA Rail for your overnight journey to Vancouver. Dinner is included onboard this evening. Overnight onboard VIA Rail. After an early continental breakfast, you will arrive into Vancouver at approximately 8:00 am this morning to end your tour. Would you like to give us your suggestions and have us build an itinerary that fits your desires and suits your budget? Together we can make your dream holiday a reality. Have accommodation concerns? We work with a great wholesaler who can find rooms at great prices even in the busy season. Let us plan the details like tours and transfers, leaving you to enjoy your holiday. Fill out our Vacation Request Form.